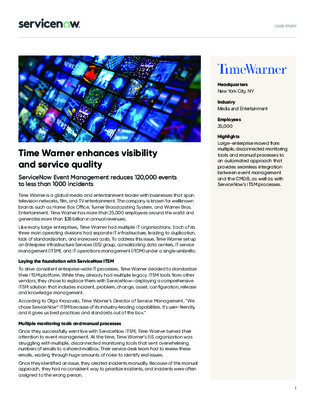 As a global media powerhouse behind names like HBO, Warner Bros, and more, Time Warner relies on multiple IT organizations to support each of their divisions. However, this has led to problems due to a lack of standardization, an influx of duplication issues, and increased overall costs. Inside this case study, learn how Time Warner moved from multiple disconnected monitoring tools and manual maintenance processes to an automated approach, providing seamless integration between CMDB and event management systems – and ultimately increasing the value-add of their ITSM processes.